His Grace Ajamil Prabhu was born in a village close to Mayapur called Gopinagar, in the district of Nadia, West Bengal, India. He joined ISKCON on October 1977. He comes from a vaisnava background. 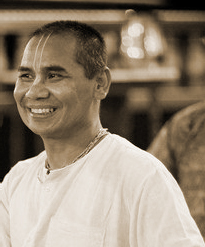 Before coming to ISKCON he was a Bengali folk singer, that's why his singing style represents pure bengali folk.